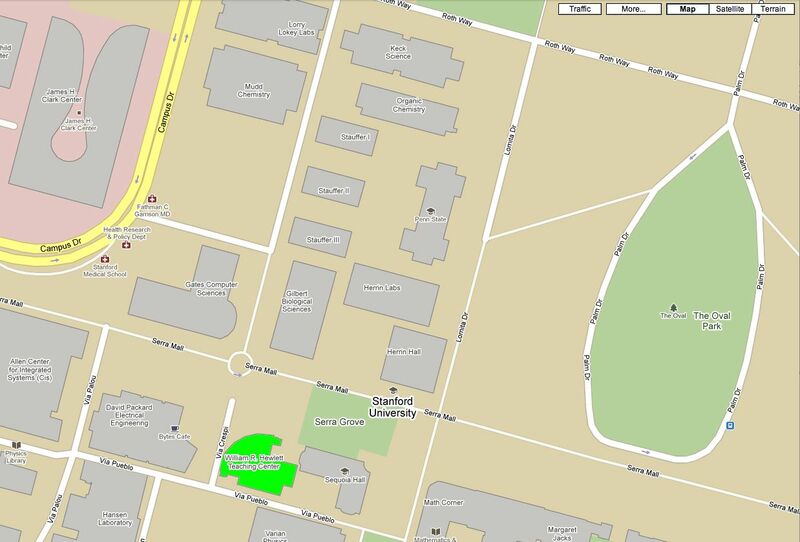 The first map below shows the Hewlett Teaching Center, highlighted in bright green, slightly to the left of bottom center on this the map. 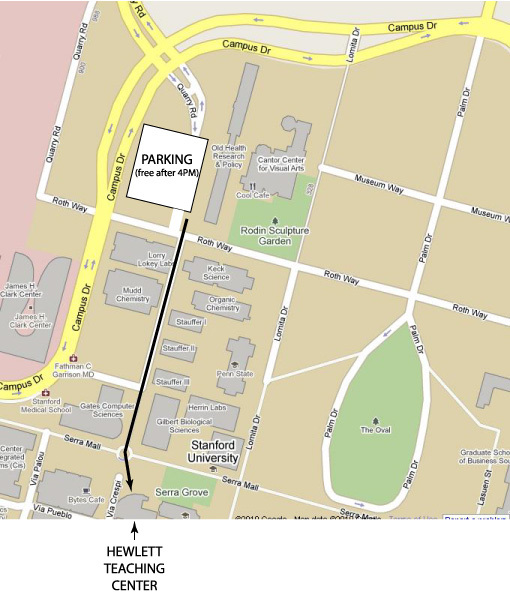 As you can see, Hewlett Teaching Center is about a block and a half west of the Oval at the end of Palm Drive. (Palm Drive what Palo Alto's University Avenue becomes once it is on the campus. The map is higher resolution than shown in your browser so, if needed to see details, zoom in or download the map and view separately. The second map below is smaller scale to also show the location of a parking garage you can use. Almost all parking on campus, including in this garage, does not require a permit after 4 PM. Please check signs to make sure you are not in one of the few areas that require a permit in the evening. Parking around the Oval is also unrestricted after 4 PM, but is often full. A better place to look for parking is near the Museum (shown as "Cantor Center for Visual Arts" on this map) and the Rodin Sculpture Garden. There are several places to park on Lomita Drive, Roth Way and Museum Way (see map).